Printing inks have become an indispensable part of everyday life. They are used for the purpose of printing in various sectors. Printing inks are pigments that are blended with oil or varnish to achieve the desired effect. The introduction of several new products, solutions, and services have also encouraged the growth of the North America printing inks market in recent years. According to the research report by Transparency Market Research, the North America printing inks market is expected to be worth US$8.7 bn by 2024 as compared to US$5.3 bn in 2015. During the forecast years of 2016 and 2024, the overall market is expected to expand at a CAGR of 5.70%. Printing inks are predominantly used in thin films and on a variety of substrates such as metal sheets, paper, paper boards, and others. These inks are also used for purposes such as protecting the surfaces, decorative purposes, and largely for communicative functions as well. Printing inks are made from additives, pigments, solvents, resins, and colorants, while the colorants are made from dyes, toners, pigments, or combinations of all of these materials. Due to growing concerns about the environmental pollution, the North America printing inks market is focusing on making bio-based printing inks. The demand for printing inks is directly dependent on the prices of crude oil. Thus, the persistent volatility of crude oil prices across the globe has had a significant impact on the printing inks market of North America. The overall market is also being positively impacted by the growing demand for UV-cured ink, rising population base, and increasing consumer spending on various types of products. Out of the various types of products, analysts anticipate that the oil-based printing segment is expected to hold a dominant position in the overall market due to its extensive use in commercial areas as well as for publication purposes. As of 2015, the oil-based printing inks segment held a lion’s share of 39.9% in the North America printing inks market in 2015. 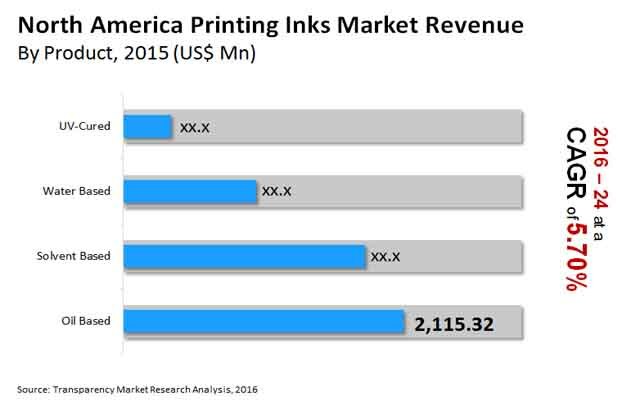 In terms of application, the North America printing inks market will be segmented into flexographic printing, gravure printing, digital printing, offset printing, specialty printing, and screen printing. The report suggests that offset printing held a dominant share of 41.2% in 2015 in the overall market, which was closely followed by flexographic printing. The growing preference for offset printing due to advantages such as high and consistent image quality that it offers. On the other hand, lithography is extensively used printing processes by several individual companies as compared to other application processes. On the basis of end users, the market is segmented into metal cans, publication and commercial printing, textiles, packaging, and others such as decorative printing. In 2015, the packaging segment held a share of 46.5% share in the North America printing inks market. The printing segment is expected to show its dominance over the forecast period, predict analysts. The leading players operating in the North America printing inks market are Siegwerk Druckfarben AG & Co. KgaA, INX International Ink Co., Flint Group, Sun Chemical Corporation, Wikoff Color Corporation, Toyo Ink America, LLC, American Ink and Coatings, DuPont, Huber Group, Electronics For Imaging, Inc., Sanchez SA de CV, Quad Graphics Inc., and FUJIFILM Corporation. This research study analyzes the market for North America printing inks in terms of revenue (US$ Mn) and volume (Kilo Tons). The North America printing inks market has been segmented on the basis of product, application, end-use, and country. The report features a detailed segmentation with market growth forecasts from 2016 to 2024. 2015 has been considered the base year and 2016 the estimated year, while all forecasts have been given for the period from 2016 to 2024. Market data for all the segments has been provided at the submarkets and country-specific levels from 2016 to 2024. The report provides a broad competitive analysis of companies engaged in the production and distribution of printing inks in North America. The report also includes key market dynamics such as drivers, restraints, and opportunities affecting the North America printing inks market. These are analyzed in detail and illustrated in the report with supporting graphs and tables. The report also provides a comprehensive analysis of the market with the help of the Porter’s Five Forces Analysis model, which helps in understanding the factors that affect the structure and profitability of the North America printing inks market. These are the bargaining power of buyers, bargaining power of suppliers, threat of new entrants, threat of substitutes, and degree of competition. The report provides detailed insights into the North America printing inks business. Currently, numerous factors drive the North America printing inks market. The most prominent drivers include growth of renewable energy, volatility in crude oil prices, bio-based raw materials, oil & gas industry outlook, North America printing ink production facilities, growth rate of end-user industries, and others. Market attractiveness analysis was carried out for the North America printing inks market on the basis of product, application, end-use, and country. Market attractiveness was estimated on the basis of common parameters that directly impact the market. Flexographic and gravure printing inks are primarily used with solvents as base materials. Flexographic and gravure printing methods are widely employed in flexible packaging, especially in food and beverages industries. Solvent-based inks consist of inorganic solvents and toxic metals such as cadmium, hexavalent chromium, lead, and mercury. These lead to various health hazards if they come in direct contact with edibles. The number of safety regulations in North America has been increased in order to avoid adverse health consequences resulting from intake of toxic substances. This is likely to hamper the printing inks market in the next few years. In North America, demand for VOC-free printing inks is gaining momentum. Increased environmental regulations regarding usage of VOC inks are driving the market for UV-cured printing inks. Packaging is considered one of the highly important marketing aspects that influence the consumer’s purchasing decision. In North America, the packaging industry is one of the major consumers of printing inks. Expansion of the food & beverages industry along with increased demand for flexible packaging from the health care sector is expected to boost the demand for printing inks in the next few years. The North America printing inks market has been segmented into four categories: product, application, end-use and country. In terms of product, the North America printing inks market has been classified into solvent-based, water-based, oil-based, and UV-cured. In terms of application, the North America printing inks market has been classified into flexographic printing, gravure printing, offset printing, digital printing, screen printing, and specialty printing. In terms of end-use, the North America printing inks market has been classified into publication & commercial printing, packaging, textiles, metal cans, and others (decorative printing etc.). In terms of country, the North America printing inks market has been segmented into the U.S. and Canada.